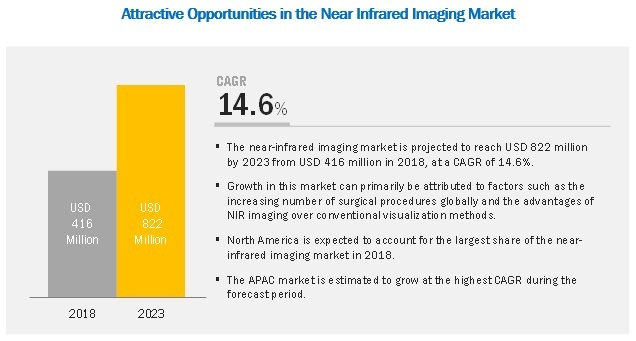 [175 Pages Report] The near-infrared imaging market is projected to reach USD 822 million by 2023 from an estimated USD 416 million in 2018, at a CAGR of 14.6% during the forecast period. Growth in the near-infrared imaging market can primarily be attributed to the increasing number of surgical procedures globally and the advantages of NIR imaging over conventional visualization methods. Based on product, the market is segmented into devices and reagents. In 2018, the devices segment is expected to account for a larger share of the near-infrared imaging market majorly due to the rising prevalence of cancer and the increasing number of research activities on cancer. Based on type, the near-infrared imaging reagents market is segmented into indocyanine green (ICG) and other reagents. The indocyanine green segment is expected to grow at a higher CAGR during the forecast period owing to the fact that ICG is the only approved fluorescent dye for clinical use with all key products such as SPY elite, PINPOINT, and SPY-PHI. Also, ICG is cost-effective and has potentially no adverse effects. On the basis of end user, the near-infrared imaging market is segmented into hospitals & clinics, research laboratories, and pharmaceutical & biotechnology companies. Hospitals & clinics are estimated to form the fastest-growing end-user segment in this market majorly due to the increasing prevalence of cancer and the rising number of plastic and reconstructive surgeries performed in hospitals and clinics. North America is the major revenue generating region in the near-infrared imaging market. The near-infrared imaging market in North America is driven by the high healthcare spending, rising geriatric population, rising prevalence of target diseases, increasing number of cosmetic surgeries, and the rapid adoption of technologically advanced imaging systems in the region. The key players operating in the near-infrared imaging market are Stryker (US), KARL STORZ SE & Co. KG (Germany), Carl Zeiss Meditec AG (Germany), Leica Microsystems (Germany), Olympus (Japan), Fluoptics (France), Hamamatsu Photonics K.K (Japan), Quest Medical Imaging B.V. (Netherlands), Mizuho Medical Co, Ltd. (Japan), Shimadzu Corporation (Japan), Visionsense (Israel), PerkinElmer, Inc. (US), LI-COR, Inc. (US), and SurgVision (Netherlands). In 2018, Medtronic acquired VisionSense, an Israel-based company engaged in the development of imaging and visualization solutions for minimally invasive surgeries. This allowed the company to gain access to VisionSense’s near-infrared imaging devices. In 2017, Bracco Imaging entered into the near-infrared imaging market with the acquisition of SurgVision.Surgvision is a start-up company focused on developing fluorescence image-guided surgery platform solutions using high-definition cameras and tracers. The acquisition of Surgvision has expanded Bracco’s portfolio of imaging solutions for healthcare professionals in oncology. In 2017, Stryker acquired NOVADAQ Technologies Inc., a leading developer of fluorescence imaging technologies providing surgeons with the visualization of blood flow in vessels and related tissue perfusion in cardiac, cardiovascular, gastrointestinal, plastic, microsurgical, and reconstructive procedures, for USD 701 million. This strategic acquisition made Stryker a leading player in the near-infrared imaging market. What are the key players operating in the market and how intense is the competition? Emerging countries provide immense opportunities for the growth of the near-infrared imaging market. Will this scenario continue in the coming years? What product segments will dominate in the coming years? What are the challenges limiting the adoption of near-infrared imaging systems? 11.9 Quest Medical Imaging B.V.
11.10 Mizuho Medical Co., Ltd. The study involved four major activities to estimate the current size for the near-infrared imaging market. Exhaustive secondary research was done to collect information about the market, peer markets, and the parent market. The next step was to validate these findings, assumptions, and sizing with industry experts across the value chain through primary research. After this, both top-down and bottom-up approaches were employed to estimate the complete market size. Finally, market breakdown and data triangulation were used to estimate the market size of segments and subsegments. In the secondary research process, various secondary sources such as the The Optical Society (OSA), International Society for Optics and Photonics (SPIE), U.S. Department of Health & Human Services (HHS), National Institute of Biomedical Imaging and Bioengineering, World Health Organization (WHO), BioOptics World, Eurostat, American Stroke Association, National Institutes of Health (NIH), Photonics Media, World Cancer Research Fund International (WCRFI), Statistisches Bundesamt (Destatis), European Network on High Performance and Embedded Architecture and Compilation (HiPEAC), European Society of Surgical Oncology, Commissariat à l’Energie Atomique et aux Energies Alternatives (CEA), directories, industry journals, databases, press releases, and annual reports of companies have been used to identify and collect information useful for the study of this market. In the primary research process, various sources from both the supply and demand sides were interviewed to obtain qualitative and quantitative information for this report. The primary sources from the supply side include industry experts such as CEOs, vice presidents, marketing directors, technology and innovation directors, and related key executives from various key companies and organizations operating in the near-infrared imaging market. The primary sources from the demand side include surgeons, purchase managers, and personnel from research organizations and academic institutes. After arriving at the overall market size—using the market size estimation processes as explained above—the market was split into several segments and subsegments. To complete the overall market engineering process and arrive at the exact statistics of each market segment and subsegment, data triangulation and market breakdown procedures were employed, wherever applicable. The data was triangulated by studying various factors and trends from both the demand and supply sides. This research report categorizes the near-infrared imaging market based on product, application, end user, and region.